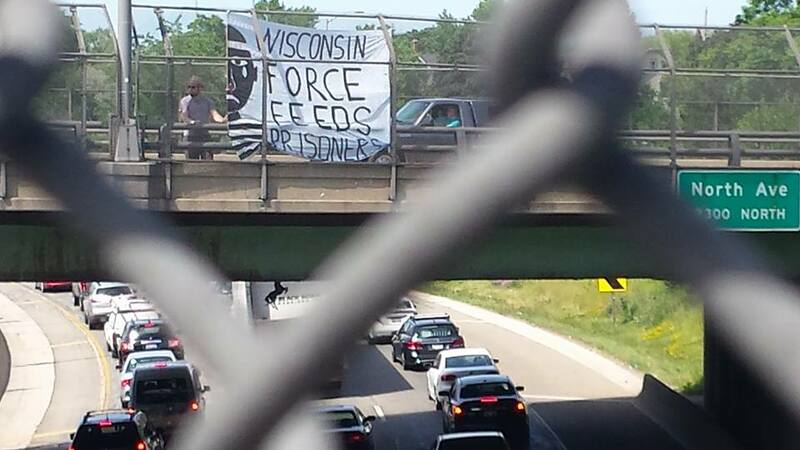 Across the country freeways are blocked, people take the streets, law enforcement officers are confronted and their buildings are occupied, and more and more people are questioning the institutions of policing and incarceration. In the past month, nearly every major city and many smaller ones have seen some sort of protest, demonstration, or disruption in the wake of ongoing police murders that have recently included two African-American men, Alton Sterling and Philando Castile. Helping set the context for this rebellion has been growing anger at both Trump and Clinton and ongoing resistance to white nationalist and fascist organizing which becomes more and more confrontational. At the same time, talk of abolishing the police and the prison system is no longer a fringe idea, as these positions are being discussed more and more broadly by wide segments of popular social movements. 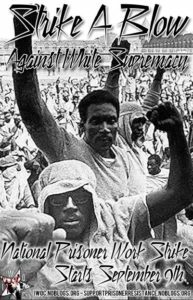 But while much of the news, either mainstream of radical, has been dominated by riots outside of Trump rallies, massive revolts in Ferguson, Baltimore, and Oakland, and the evolving Black Lives Matter movement and growing far-Right white reaction to it, at the same time a radical, broad based, and ever growing multi-racial prison labor movement has been carrying out strike after strike, action after action, and expanding in size, every day. 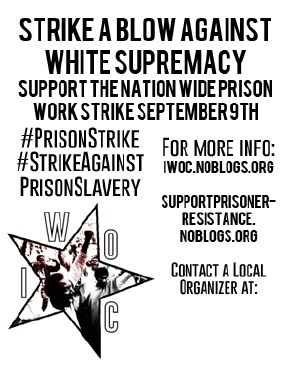 This is not only a strike against bad conditions, for the changing of rules around things like parole, and to actually be paid for their labor which makes billions for multi-national corporations, but against white supremacy itself. When the 13th Amendment was passed in 1865, it in theory banned slavery, except in the form of imprisonment. 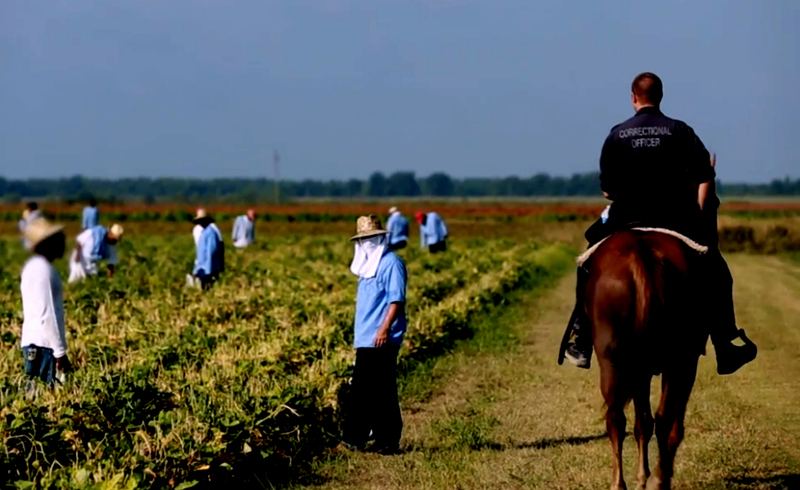 While many former slaves simply became indentured share croppers, over the decades following the civil war corporations and governments continued to look towards prisons as a major source for free and cheap labor. 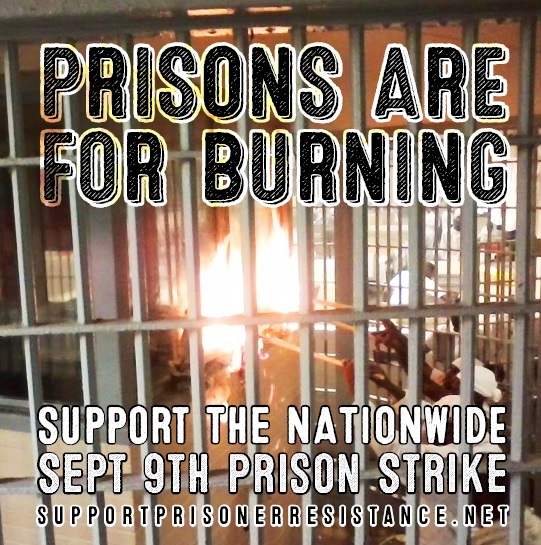 3) Having…supporters…hold…protests at the prisons where the people are mass incarcerated and oppressed. The [hunger strikes]…showed us all that with leadership and unity, we can defeat mass incarceration with the right strategy. But, we also learned that, while we did see progress in some areas, it has a minimal impact on the system of mass incarceration. We have to ask ourselves: If we are protesting against mass incarceration and prison slavery, then why aren’t we doing it at the prisons where our economic strength can be felt? 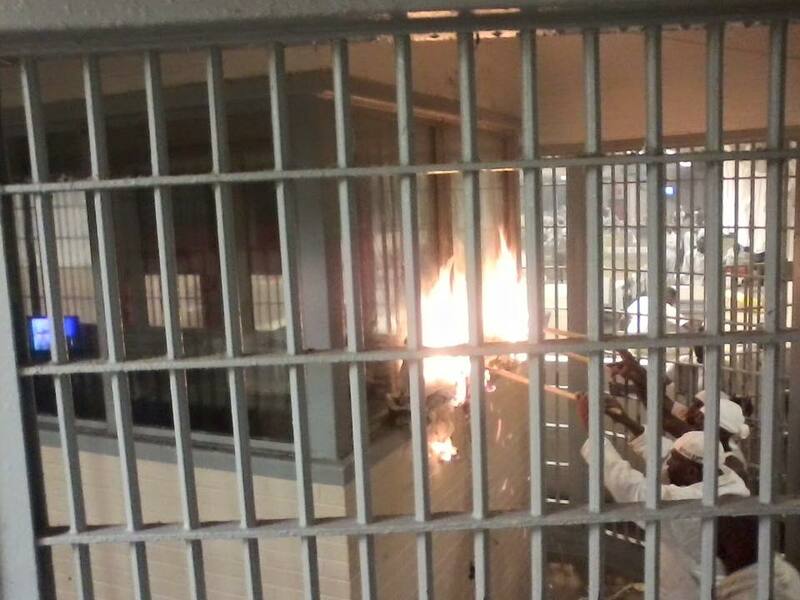 This disruptive power is a force that has been growing in the last several years and months, as prisoners in a variety of facilities have carried out actions and launched a variety of revolts. 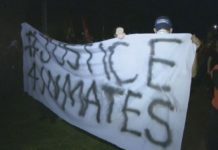 From the riots that have raged at Holman Prison in Alabama, ongoing hunger and work strikes that have taken place from Texas to Wisconsin to Nevada, to the support and noise made in solidarity with prison May Day strike actions, all of this activity has been building towards September 9th. 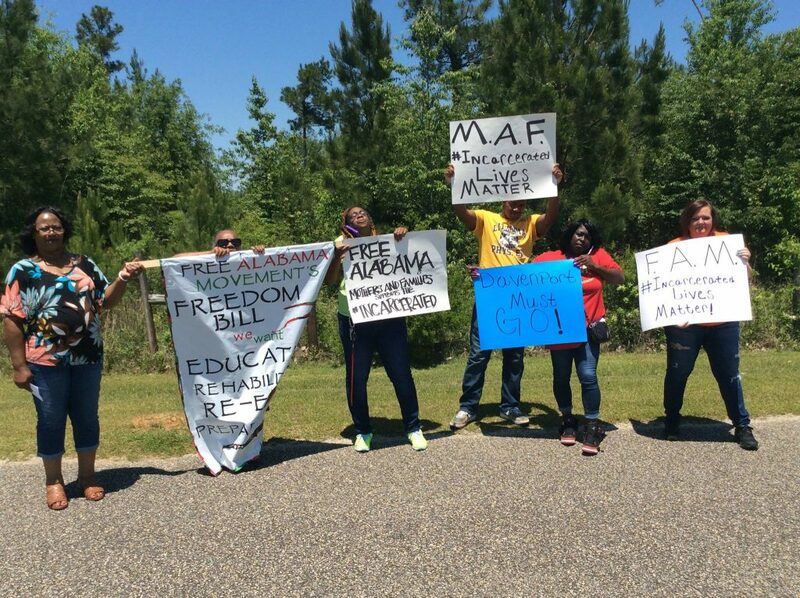 Over the last several years, the Free Alabama Movement has grown into a mass movement that involves prisoners across every state in the US. There are currently Free Movements in Ohio, Mississippi, Virginia, Texas, and many more. 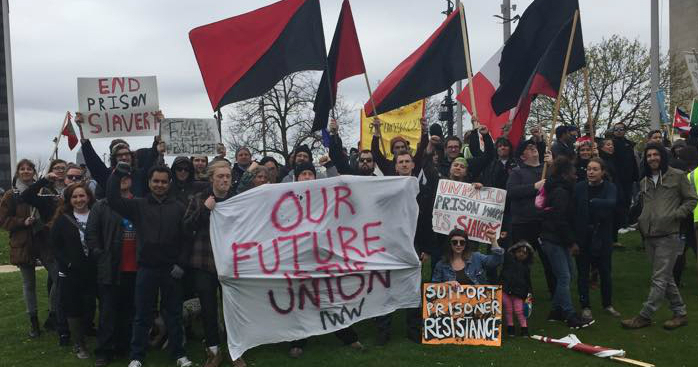 Working closely with FAM has been outside organizations such as MAF, or Mothers and Families of FAM, and the Incarcerated Workers Organizing Committee (IWOC), which is a committee within the Industrial Workers of the World (IWW), a revolutionary anti-capitalist labor union founded in 1905. 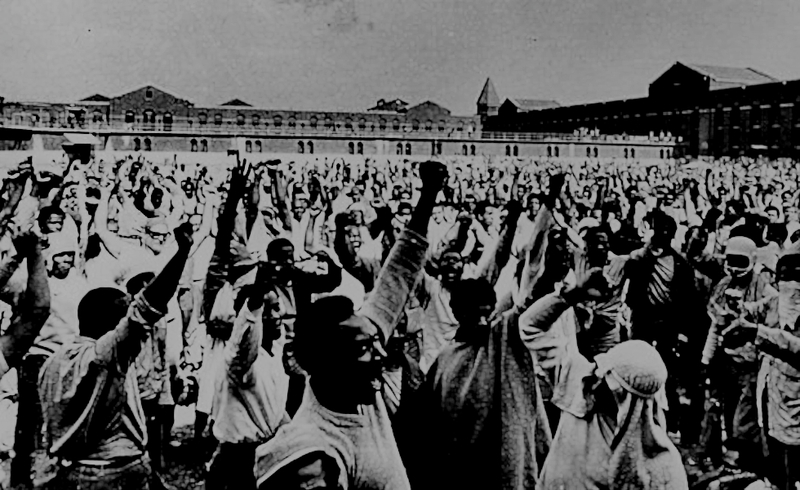 Currently, the Incarcerated Workers Organizing Committee has signed up close to 1,000 prisoners to become members of the IWW and along with Anarchist Black Cross (ABC) chapters and a variety of prisoner support groups, have helped to offer support to the growing prison labor movement. This organizing and support from a variety of groups, crews, coalitions, and individuals has been crucial. But our work is only just beginning. 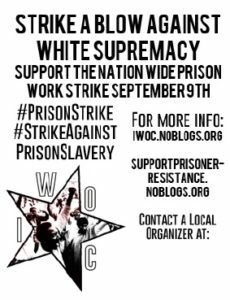 We need to push, plan, organize, and build capacity for the upcoming strike on September 9th and the days that come after, as repression and lock-downs are sure to follow, and in some cases, have already begun. September 9th is an opportunity for us to act in solidarity with comrades we have already been building with; both on the inside and on the outside. At the same time, it is a moment where we can take part in a historical struggle and bring people into the real nitty gritty work of attacking a pillar of white supremacy and racial apartheid. To be sure, it does not appear that people in the US are going to be leaving the streets anytime soon. Even if things cool down in the next 7 weeks, September 9th is something that we can build around and that will also help push us into the future. Now is the time to use this strike as a way to build capacity and bring new people into the organizing. 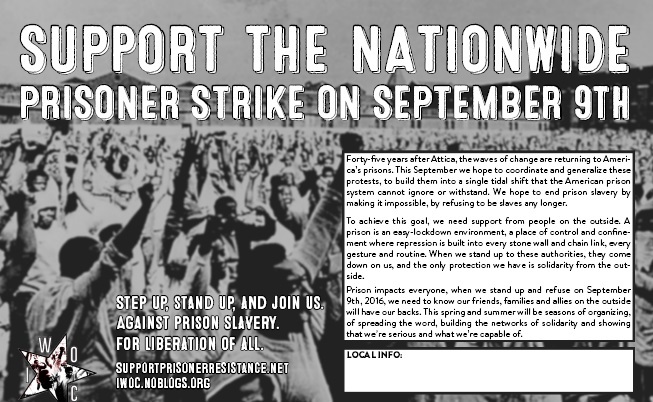 The strike is also an opportunity to make real connections with communities most affected by the prison industrial complex and connect them to revolutionary grassroots movements across the country. 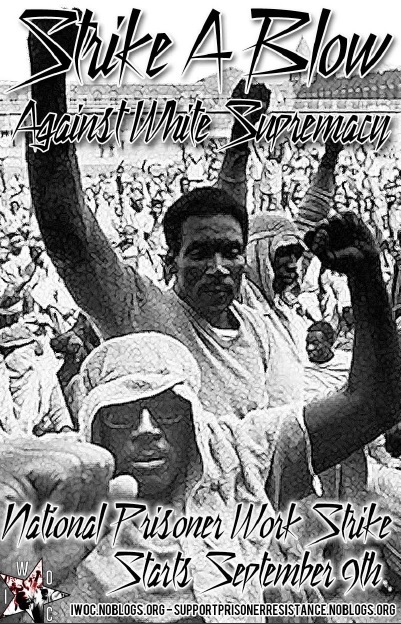 Let us use this momentum and action as a way of generalizing a radical critique of white supremacy and the established order, and the need for people to take sides and organize themselves in their neighborhoods, workplaces, and schools. But above all, it is an opportunity to stand in solidarity with prison rebels who have been taking risks and putting their lives on the line to strike a blow against prison slavery and the world that it maintains. There’s a lot we can do not only in taking action on September 9th and the days following (some people are planning actions on Saturday September 10th, so as to not conflict with work schedules) but also in the critical build up for it. To be clear, the work and organizing that we do before the strike is just as important, if not more so, in creating a material force that can act within the moment. Organizing and building before hand helps us to create a base of support and brings new people into the organizing; this activity creates a movement. Towards this end, we’ve created a list of ideas about how people can take part in the action, wherever they live. 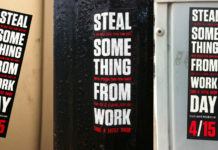 Flyering, wheatpasting, stickers and general outreach. Print out flyers (some are linked below) and begin to put them up around where you live, where you work, and where you go to school. Make stickers from cheap sticker paper at the copy store and place them up in the same way. Host a fundraiser or party and save up to get nicer vinyl ones. Get a team together (or go by yourself) and put up posters using wheatepaste. Building a buzz around the strike is crucial. 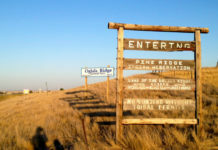 Focus on areas with a high traffic of people and within communities that would be sympathetic to the strike. Write graffiti and drop banners. 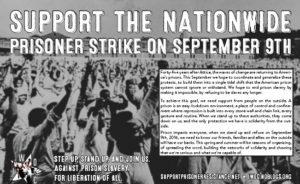 Write anti-prison and pro-strike slogans in your area. Make banners out of bed-sheets or find ones (like those found outside of fast food restaurants) to place up around your area. Freeways are good spots, as are heavy foot trafficked areas. Use plastic zip ties to place the banners up and paint or spray paint to write the messages. Take pictures of such activity and send a report to itsgoingdown.org. Set up an info-table or organize a “Coffee Not Cops” outside of a jail or courthouse. Placing a table with flyers and info outside of a local Wal-Mart, flea market, grocery or dollar store, or food stamps office is a quick way to talk to a lot of people. It’s also a smart thing to do if you want to connect with people outside of political or activist circles. You can also organize a Coffee Not Cops event outside of the courthouse or local jail. 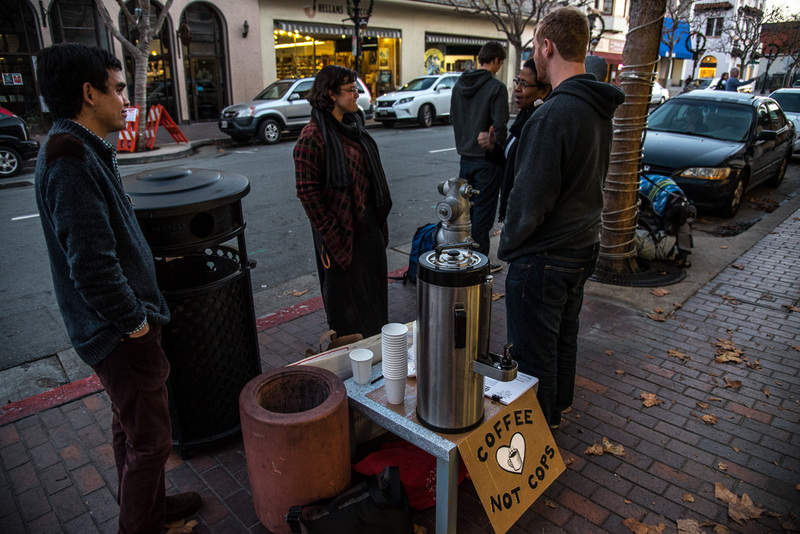 Coffee Not Cops is just like Food Not Bombs, but instead of serving a large meal people just give out coffee and sometimes donuts or pastries. Along with the hot beverages and treats, be sure to give out flyers and info on the upcoming strike and ways that people can plug in. We encourage people to set up tables outside of courthouses before people go into court (usually around 8 AM). This is an audience we want to connect with and often one that would welcome a hot cup of coffee and something to read. Bring a banner, a table, some chairs, and your materials. Hold an informational event. Organize an educational event in which you can tell members of the public and other organizers about the upcoming strike. To get in contact with a speaker that could either Skype in (talk via the internet on video) to the event or get you in contact with a local presenter, hit up iwoc [at] riseup.net. There are also several youtube videos which can serve as a good introduction to the strike, check them out below. Host a public BBQ. Once you have a general plan about what you will do on September 9th (or on Saturday the 10th or the days following), consider hosting a public BBQ (if the information is something you want to share with other people) in which plans for the strike are announced and informational and outreach materials are handed out to those that come. The more ways that people have to connect into the organizing, the better. Link up with people on the inside. Find out if there is a prisoner support group in your area. Find ways to make connections with people on the inside and get information on the strike to them. 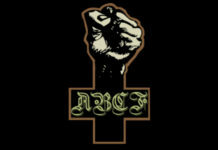 Contact a local Anarchist Black Cross or Prison Books group for more information on how to get started. Fundraise. Throw a benefit show, host a dance party with a bar, do whatever it is you do best and raise some money! Either put it towards your own plans for September 9th or donate it to the groups that are doing much of the national coordination. Get linked in on social media. Follow IWOC on twitter here and on Facebook here. 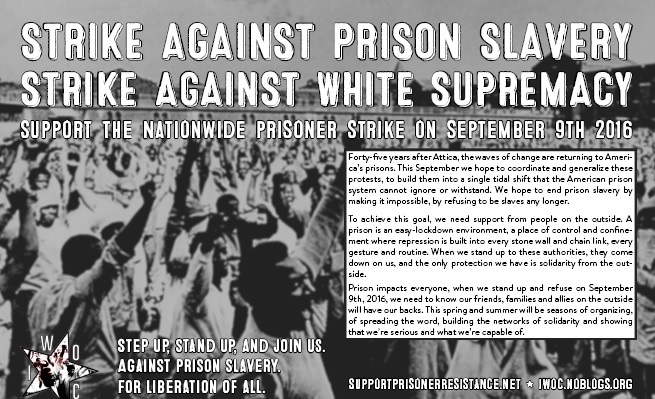 Use the hashtags #PrisonStrike and #StrikeAgainstPrisonSlavery on social media. Hold a noise demo outside a prison or jail. 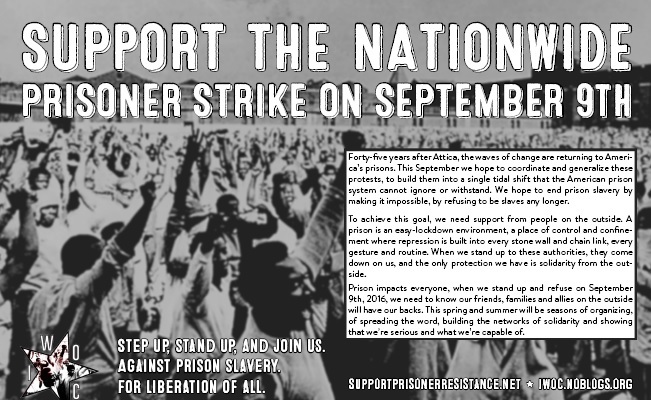 Make some noise for prisoners on the inside on the day of the strike or in the days after. Bring banners, music, and noise makers. If you can take and hold the streets, try and do so. If you can’t, stay on the sidewalk and be a presence there. Be sure to have outreach materials to give out to people walking by and be loud enough to people on the inside can hear you. Take pictures and send a report in to itsgoingdown.org. 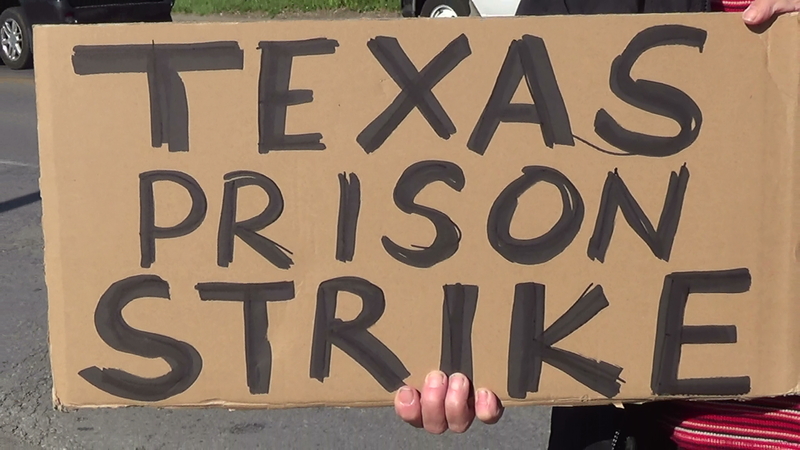 Protest and demonstrate outside of a business that makes money from prison labor. 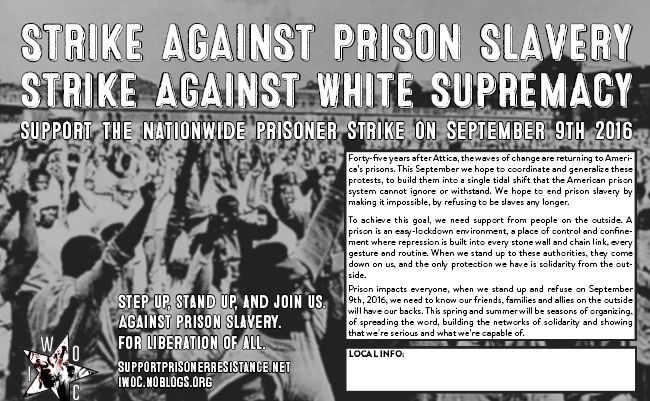 Find a business in your area that makes money off of prison slavery. Protest, demonstrate, shut them down. Have banners and flyers ready. If there are several businesses in your area, hold a march to the different establishments if you can. Draw connections between prison slavery and the wage slavery of capitalism. Link up with Fight for $15 groups if possible. Outreach and talk to workers on the day of as well as the people at the business. Let them know why you are doing this and give them information on the fight against prison slavery. Regular working-class and poor people are not our enemies, they are our potential allies. Take pictures and send a report in to itsgoingdown.org. Some of these companies include McDonald’s, Victoria’s Secret, Wal-Mart, Wendy’s, AT&T, and the US Military. Many other corporations are implicated. Note, Whole Foods has ceased using prison labor. Get creative! 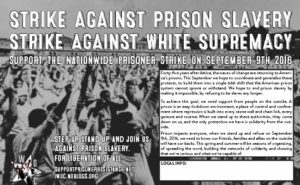 What actions can be taken to aid in the struggle of prisoners against prison slavery? Get ready for repression. Those that are taking part in the strike are expecting repression. Set aside time to host call-in events where you put pressure on the prison to release prisoners. Also, organize events where you write into prisoners that are active in the resistance movement. Build relationships and stay in contact. This isn’t the last time we will have to do this, so lets start talking to each other. Pull new people into the organizing. Many people are out on the streets for the first time right now. Against Neo-Nazis, the KKK, and other white nationalists, against Trump, and against the police. Pull them into the organizing and keep them there. 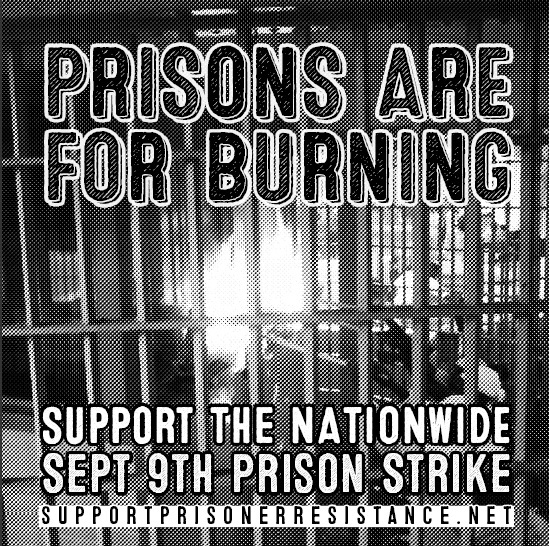 Let the strike on September 9th be something that builds our movements. Have a debrief and report back event on the strike actions. Once the strike actions have been carried out, report back to the wider community about what happened. What went well? What didn’t go well? How can we do better next time? 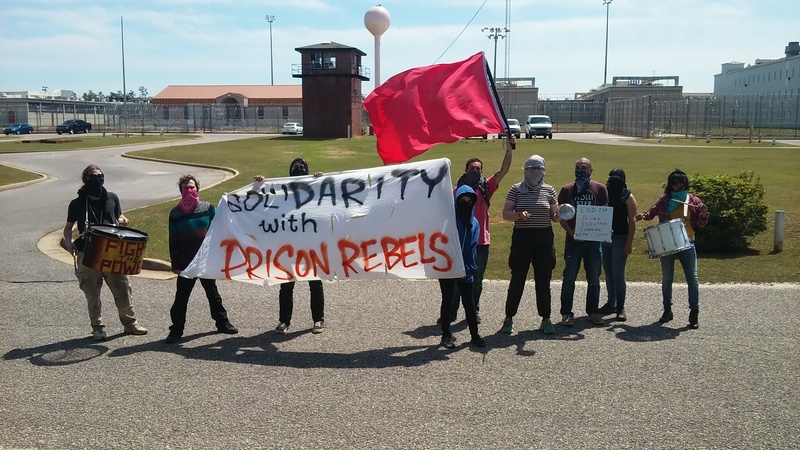 How can people feed into and support ongoing prisoner organizing and rebellion? Again, discuss how this activity will push us into the future, not be a one off thing that simply, ends. Even if you are living in a small town, reading It’s Going Down by yourself on a break at work, or you are part of a crew or organization, we all can help push the strike and make it a success. Whether together or alone, either in a group of 5 or 500, we are part of a worldwide movement and we can show our strength when we are organized and committed to do so. Let the Crops Rot in the Field (Great text from FAM). A Call to End Slavery In America (Zine for mass printing, includes two on a page). 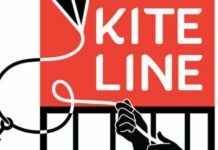 May Day 2016: Towards a World Without Prisons (Geared for May Day, but includes excellent articles). 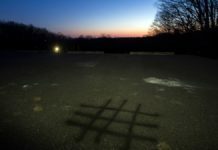 Incarcerated Workers take the Lead: Prison Struggles in the United States: 2008-2016 (In depth article on the history of this most recent round of prison struggles). 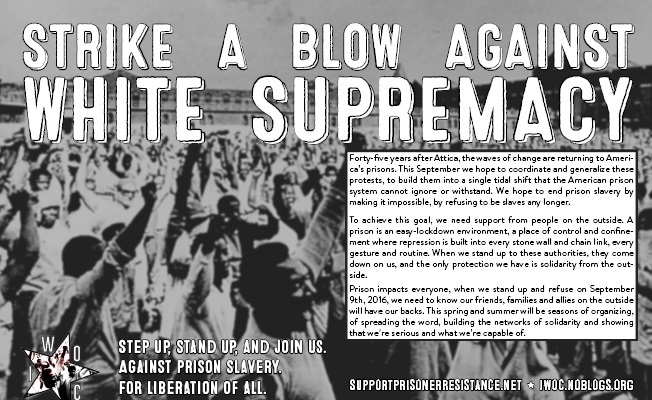 To Struggle Means We Are Alive (Prisoners talk about the Ferguson rebellion and more). End Prison Slavery (Collection of various texts). Support Prisoner Resistance PDF Collection (Includes many versions that are better suited for sending into prison).